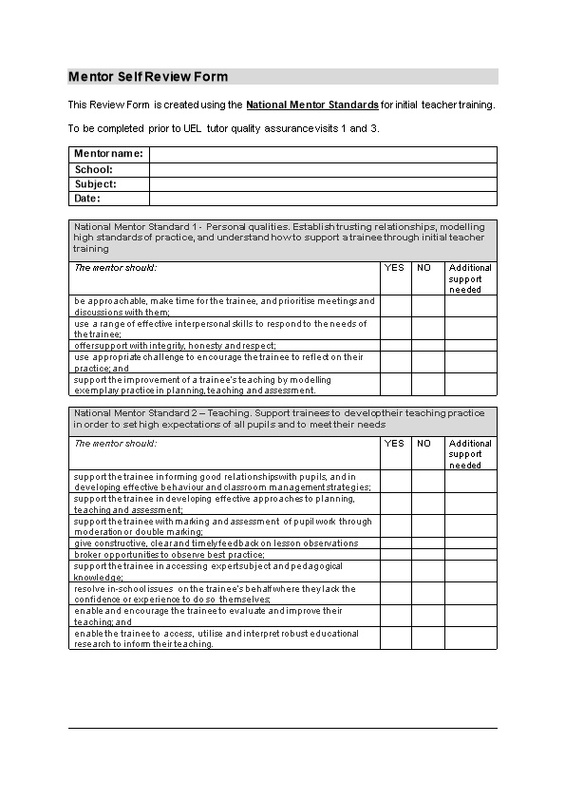 This Review Form is created using the National Mentor Standards for initial teacher training. To be completed prior to UEL tutor quality assurance visits 1 and 3.
support the improvement of a trainee’s teaching by modelling exemplary practice in planning, teaching and assessment. enable the trainee to access, utilise and interpret robust educational research to inform their teaching. support the trainee to develop skills to manage time effectively. National Mentor Standard 4 – Self-development and working in partnership. Continue to develop their own professional knowledge, skills and understanding and invest time in developing a good working relationship within relevant ITT partnerships. continue to develop their own mentoring practice and subject and pedagogical expertise by accessing appropriate professional development and engaging with robust research.